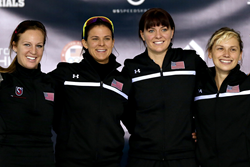 US Speedskating continues its focus on the development of elite athletes with the announcement of this year’s National Training Program. The 2014-2015 season will introduce talent fresh off the Junior World Cup circuit in addition to seasoned Olympians. Familiar faces JR Celski, Sarah Chen, Alyson Dudek and Emily Scott return to the National Training Program for the 2014-2015 season. Joining them will be Jeff Simon, whose performance was instrumental in helping the USA qualify as the world’s top ranked relay team going into Sochi. US Speedskating’s Long Track national team reloads for the 2014-15 season with internationally successful veteran athletes including Olympians Brittany Bowe, Joey Mantia and Mitch Whitmore, as well as a new talented youth movement, eager to prove themselves on the World Cup in the sport of Speedskating.